In ancient times, the indigenous population of Kalimantan – the Dayaks – were feared as notorious headhunters. The headhunting Dayaks executed their fearsome practices through using a traditional mandau sword. Throughout the centuries, this has caused the mandau to become inextricably linked to headhunting. However, due the decline of the Dayaks’ ancient traditions in the early twentieth century, the mandau gradually changed into a weapon used for (forest) hunting, or simply a practical tool to cut plants and small trees with. Hence, it has now become almost impossible to find an ancient and authentic mandau. 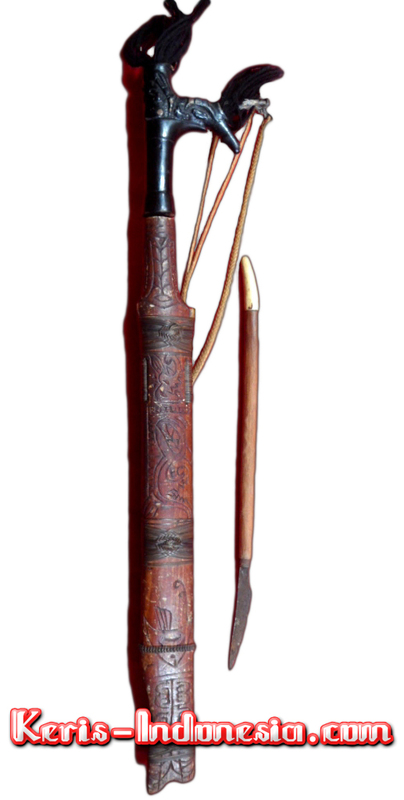 But this mandau, however, is a rare and original pusaka item, which indeed has been frequently used in headhunting missions in Kalimantan, Indonesia. It is thus considered to be a very sacred weapon. 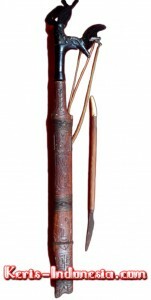 The hulu (hilt) of this mandau is carved from a sacred type of wood, and features traditional Dayak motifs that are hand carved on the surface of both the hilt and sheath. According the traditional beliefs of the Dayaks, the owner of this mandau will be admired by many, and this person shall therefore also enjoy a high rank in society.